I’ve been getting back into the weeds of Office 365 of late, building out training materials and preparing for certification. It’s been a bit on the geeky-fun side, but not all the time .. there are a lot of moving parts, and not a lot of time to debug (I do have a real job). “Cmdlets” for performing common tasks, including access to system-level resources, the Registry, the file system the Windows Management Instrumentation (WMI) interfaces (and more!). Task-based scripting language support for command-line tools. Common syntax and naming conventions, allowing easy flow control between cmdlets: the output from one cmdlet can be used as the input to another cmdlet. An extensible interface allowing for custom tools and utilities. Download and install the Office 365 Sign-in Assistant. Select the 32- or 64-bit version for your workstation. Then, you need the Office 365 cmdlets. Select the 32-bit or 64-bit version for your workstation. Managing Windows Azure Active Directory for your Office 365 installation? PowerShell can help there with the Windows Azure AD PowerShell Module. The best part? The commands therein are included with the Office 365 cmdlets, above. Windows PowerShell User’s Guide, loaded with real scripts and usage scenarios. Getting Started with Windows PowerShell. A solid introduction and tutorial. Microsoft Virtual Academy: Getting Started with PowerShell 3.0 Jump Start. This course is targeted at IT Professionals to help them use Windows PowerShell for management, automate tasks and manage systems. Jeffrey Snover himself (Microsoft Distinguished Engineer and the inventor of Windows PowerShell) appears in this course. Microsoft Virtual Academy: Advanced Tools & Scripting with PowerShell 3.0 Jump Start. This is an advanced Windows PowerShell that helps you learn best patterns and practices for building and maintaining management and automation scripts into reusable tools. Okay .. all these thoughts captured, it’s back to work for me. Enjoy your foray into PowerShell .. please drop me a note if you see / learn something interesting, or if I may assist. Active Directory in Windows Azure ..
.. if these fit your use cases, please reach out. I’ll connect you to the proper folks. It’s a great journey to the Cloud! As of today, Microsoft is offering access to a limited preview of the new Windows Azure SQL Database Premium service. As opposed to non-Premium, the new offering provides reserved instances for databases requiring higher performance capacity and predictable performance. Visit the Preview Page and click the ‘Try it Now’ button. When approved, visit the Windows Azure portal and request a Premium Database Quota assigned to your Cloud Services. For the Preview, customers will be limited to one database per logical server, priced at 50% of the eventual GA pricing. Please see the Windows Azure SQL Database Premium page for more details and availability updates. Great news for the Virtual Desktop Interface (VDI) types out there: as of July 1, Microsoft now allows Remote Desktop Services (formerly called Terminal Services) licenses in Windows Azure Virtual Machines. Prior to this licensing update, you were only allowed to connect to the console of your VM for administrative purposes, and only up to two users at a time. With this new licensing modification, customers can now connect as many users as they have system capacity, and of course, licenses. The Product Use Rights (PUR) documents from the Microsoft Volume Licensing site. The Virtual Machines Licensing FAQ. RDS Client Access Licenses (CALs) that are part of a a VL agreement are NOT eligible for license mobility rights, per the FAQ. Windows Client desktops (Windows 7 or Windows 8) are also not allowed in Windows Azure, or any other Service Provider (Amazon, Rackspace, etc.) as multi-tenant hosting is not covered by PUR. To increase users beyond the two administrative sessions you need to purchase RDS Subscriber Access Licenses (SALs) through the Microsoft Services Provider Licensing Agreement (SPLA) for each concurrent user accessing the VM. SPLA licenses are obtained through SPLA Resellers. Partner-Hosted Microsoft Office: running a VM with Microsoft Office installed. Thick-client application hosting (common RDP scenarios for complex, client-side applications). Demo, test and legacy environments. This is a major benefit to cost- and maintenance-conscious IT professionals, and yet another reason to get into the Cloud! 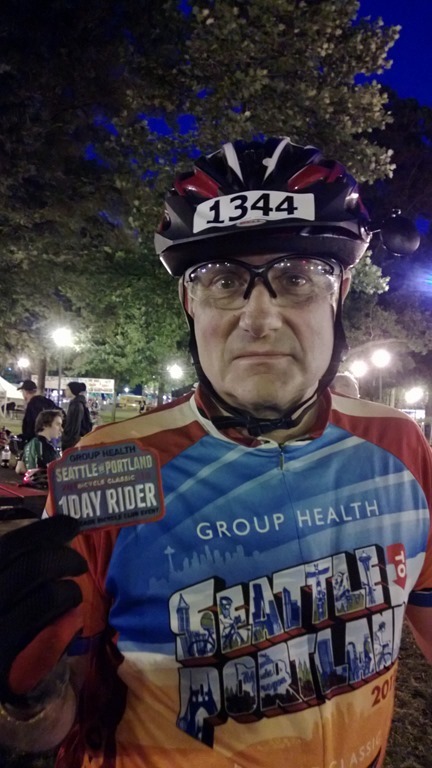 For my third year, I had the pleasure to ride with 9,999 of my fellow bicycle riding buddies in the 2013 Seattle to Portland Bicycle Classic. The ride was approximately 203 miles this year, and I completed in a single day. I made amazing time for the first half of the ride, arriving at the half-way point (Centralia, Washington) at 11:45am, 6 hours and 45 minutes after departing the UW parking lot starting point. As it’s about 100 miles, averaging 14.81 mph (with stops). I had a tire blow out (not to be confused with a flat) 1,000 feet short of the Napavine mini-stop (the top of a nicely challenging hill .. see the route map for details). Not knowing any better, I attempted to repair the blown tube, and then trying a new tube. Note that a blowout looks a lot like the results of the scene in ‘Alien’, where the innards become ‘out-ards’. While I didn’t know this at the time, a hole that size will simply destroy the tube within. I know better now. The first repair (including patching the original tube) took 30 minutes; the second, 15 (putting in a new tube). Upon inflating the tire and heading up the hill, the new tube gave way, and I was pushing the bike up the hill. My hope was there would be a mechanic at the Napavine site .. unhappily, the nearest was 13 miles back and 14 miles forward. At that point, I made the call. The ride is fully-supported .. that is, there are supplies and mechanics at nearly every stop .. except for this one. I made the call to the support number, and the truck arrived to collect me. after that, a 14-mile ride in the truck and I was on my way .. losing over three hours in the process. 6.75 hours for the first 99 miles (5am to 11:45am .. including stops). 1 hour at Centralia (insane long lines for one-day riders). 1 hour until the blow out .. 3 hours lost / 14 miles in the truck. 6 hours for the last 77 miles (4pm to 10pm). So, I got to enjoy the ride so much more than my fellow one-day riders .. 17 hours, all told .. but just under 13 hours pedaling / taking breaks, a respectable (for me 15.6 mph overall. Would have beaten a personal record, if not for the snafus. All that .. an amazing day. Please check out the ride on my Endomondo feed.